Before I begin this list of best survival guns, I have to make a disclaimer. I am a gun guy. I like AK-47s, AR-15s, M-16′s, HK-91′s, M1As, and just about anything that will take a BIG magazine and send lots of hot lead down range as fast as I can pull the trigger. I like tactical toys like chest rigs with a gazillion magazine pouches riding over a plate carrier, I like ‘em with an integrated pistol belt that holds a large frame semi-automatic pistol and even more magazine pouches. I like these things a lot, and I can envision a time when all of this might come in handy, but for the moment it’s just FUN! I sometimes get frustrated with the “totally tactical” survivalists. You know the type. They spend all their prepping/survival time and money on guns, ammo and paramilitary gear and treat food, water and self-sufficiency as a distant second. Make no mistake folks: Your first priority for preps should be securing your food and water supply, making your home capable of sustaining you and yours through whatever may come. If you haven’t covered these bases, you really don’t have anything to defend. However, there are some guns that should come fairly early on in your preparedness journey, and that is today’s topic. The first weapon I always recommend is a good shotgun. With the wide range of loads available the shotgun is probably the most versatile hunting weapon and defensive ever devised. With a good shotgun you can hunt pigeons, squirrels, rabbits, turkeys, deer and wild boar. You can also take opossums, raccoons, fox, and coyotes that may threaten your livestock. It is also effective against crows, gophers and all manner of critters that might get into your garden or orchard. Finally, the shotgun is an incredibly formidable home defense weapon. Shotguns come in several forms, but for my money the pump action is by far the best choice. Pump guns are rugged and reliable, simple to operate, and easy to learn and teach. There is nothing wrong with any of the other types. Semi-autos, single shots, and double barrels are all fantastic weapons in their own right but the pump gun is the whole package where shotguns are concerned. I like the Mossberg 500 series, and have had good luck with its slightly less expensive cousin the Maverick 88. The Remington 870 is another time-honored choice in this realm. I prefer the 12 gauge models, but am not opposed to T20 gauge for smaller shooters. One of the things that I like most about a lot of the pump guns is that it is very easy to change barrels. In order to make the most of your pump action shotgun you should have at least two barrels for it. The first one should be a field barrel, preferably with multiple choke tubes for different tasks and conditions. This one is your hunting and varmint control barrel. For this purpose, I use a 28-inch ventilated rib barrel with an “accuchoke” system. Your second barrel should be a shorter, more tactical barrel in the 18-20 inch range. This one is for home defense purposes; it is quicker handling in tight quarters and gives a wider shot spread at short ranges. This configuration gives you two guns for the price of one. If you choose to go further you can pick up specialty barrels for things like turkey hunting, and even rifled barrels to optimize shooting with slugs. The pump action shotgun is truly a workhorse, and if I could have only one long gun it would probably be my first choice. The .22 caliber rifle is another great workhorse. For starters, the ammo is very compact so you can carry or store an awful lot of it in a very small space. Things have been a little weird where .22 ammo is concerned lately, but under normal circumstances it is cheap and abundant. A good .22 will put rabbits and squirrels in the pot, will take out moles in the garden, is more than enough for most chicken coup raiders, and is a great learning and practice tool for shooters of all skill levels. It is also an underestimated defensive round, and will put down attackers quite well with good shot placement which you will be able to master with all the practice you are going to do! Training and practice are the keys to most things, and for this reason if you are new to shooting a good .22 might be your best choice for a first gun. You can choose your platform on this one. One of my favorite .22 rifles is the Marlin Glenfield bolt gun I got back in 1980-something when I was 11. This gun has served me well for more than 3 decades and shows no signs of giving out. Aside from this one, I like Ruger 10/22s. I know this sounds like a broken record time, but this little .22 semi-auto is DA BOMB! If I could disagree with other gun writers I would but I can’t on this one. The 10/22 is a tough, reliable little rifle with a lot of accessories and upgrades available. It is also fairly affordable and in my estimation this choice would not ever be a disappointment. The next long gun you should look into is a good centerfire rifle in a caliber capable of taking the largest game in your area. You will have to make your choice based on a number of factors. First, what game will you be hunting? Next, are there any regional or local favorite calibers, assuring the availability of ammunition? And then a range of personal preference and budget considerations. Generally speaking, the .308 and the 30-06 are very good choices. Both will put down anything that occurs naturally on the North American continent. The .308 has the advantage of being a current NATO round, which makes surplus ammo available and assures that in a true meltdown there will likely be ammo around. Other calibers, however, will do the job as well. There are so many good rifles out there that it is hard to pick one to recommend. One of my current favorites in the bolt gun category is the Ruger American, which is tough, reliable, fairly economical, and chambered in a number of excellent calibers. If you lean towards semis, and have a bigger budget, I highly recommend the M1A. I know a lot of hunters will tell you it is bulky and heavy, but these are a couple features that add to this rifle. The thing is a rock and can pour out a large volume of very accurate fire from its 20-round magazine, and remains an excellent battle rifle as well as a good deer rifle. The M1A was the last of the “Rifleman’s Rifles,” bridging the gap between the Garand and the “Black Guns” of today. One more suggestion for your consideration is the Mosin Nagant. We have a couple of these in my house and they are a fabulous rifle. They are as tough and reliable as you can get. They are accurate, they have plenty of knock down power, ammo is cheap, and so are the rifles themselves. The Nagant rifles are easily modernized and sporterized, and make a great addition to your gun safe. Your centerfire rifle will do double duty as your long-range defensive weapon. To misquote the infamous Gabe Suarez, rifles are good for projecting your will across a distance while pistols are ideal for controlling your immediate surroundings in unforeseen or only vaguely foreseen situations. More clearly stated, rifles are deliberate, pistols are spur-of-the-moment. Which brings us to handguns. This is a very broad range of weapons. What you want in a defensive handgun is something powerful enough to put down an attacker with the first hit, is comfortable to carry all day, is comfortable for you to shoot under any circumstances, and is reliable to a T. There are a lot of weapons that fit the bill. In semi-automatics, the most popular calibers are the 9mm, the .40 S&W, and the .45 ACP. All are good choices. I prefer the 9mm for its larger magazine capacity. I tend to carry a full-size pistol at all times, whether open or concealed, and my weapon of choice is a Taurus PT92 or an M9. Why? It is what I like and it will always get the job done. Is it the only choice? NO. A lot of personal preference will go into your choice! Revolvers are another option, and again there are too many good choices to cover here. My recommendation is for something in a .357 magnum with a four inch barrel. Revolvers are a good choice for inexperienced shooters since they are a rather intuitive weapon to operate. They are also very reliable and do not require the buying of spare magazines. If you live in Grizzly Bear country, you might want to move up to a .44 magnum. Your handgun, whatever you choose, should be your constant companion. This is the weapon that you can have at your side when a rifle or shotgun is impractical. 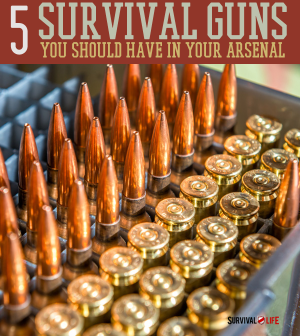 It may surprise you to know that the .22 pistol is my top choice for survival handgun. I like them because they can provide a lot of small game for food, are useful for personal defense in a pinch, are great for getting varmints out of the garden, coup or orchard, and because you can carry a whole lot of ammo. The .22 pistol is also great for cheap shooting practice. On our homestead, I am as likely to have a .22 pistol on me at any given time as anything else. This is especially true during gardening season when there is a lot of work that keeps my hands too busy for a rifle, but a lot of critters trying to get at the food I am growing. Here, again, you will be forced to make decisions. Good .22 pistols come in both the semi-automatic and the revolver format. My two favorite .22 pistols are an old target model Ruger Mark 1, and an almost as old Taurus revolver. Both have 5 ½ inch barrels and target sights, and both are deadly on small game at surprising ranges. I recommend that accuracy be a primary consideration in your .22 handgun, target barrels and good sites are a must. Other than that, personal choice! Once you have this assortment of weapons and have become proficient with them you can start looking for the more exotic types. But, the truth of the matter is that the small collection I have listed will more than likely be more than enough to see you through all but the most dire survival situation. You carry a PT92. Great piece. I have one also but cant seem to find extra mags. Do the m9 mags fit ? Im in Canada . Thanks for the great blog.